You may have noticed that it is possible to customize the default eBook and audiobook loan periods. Haven't listened to "A Northern Light" yet? 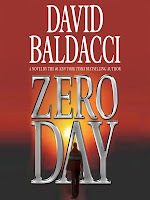 It's a wonderful book for teens and adults! 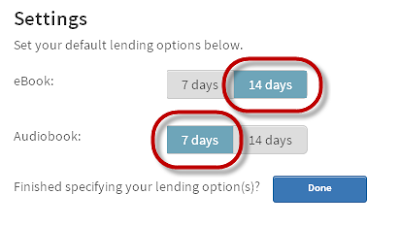 This leads you to your account settings where you can select the default loan period for audiobooks and eBooks. 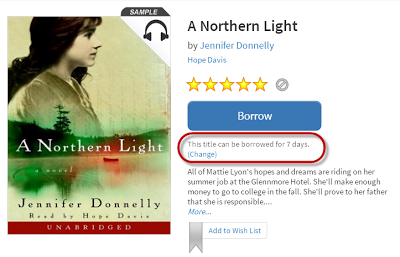 By default, we've kept the eBook loan period at 14 days and the audiobooks at 7 days. It is possible to set the default of either format to another time period. Please keep in mind that the faster the items are returned to the collection, the less money the public libraries will spend on expensive duplicate copies and the faster other patrons will get the books they are waiting for!